Sometimes springtime will have a week or so of really cold weather or even snow which we name “Blackberry Winter.” Here in the South that does not happen often, but perhaps that is why the name sticks with us because it is such an unusual event. While Blackberries do not grow here in Alabama until the summertime, they are available to remind us of the sweetness of the sun’s warmth and of the berries grown from the earth. 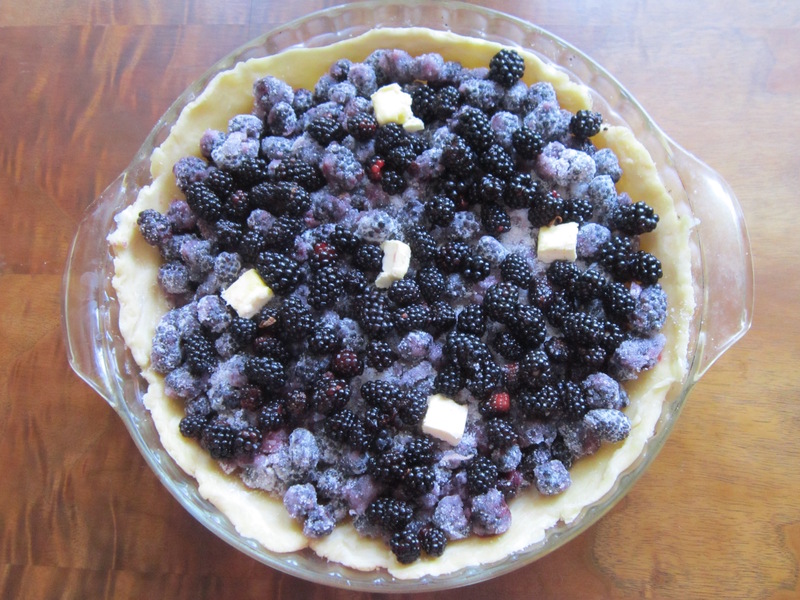 This pie can be made with fresh or frozen blackberries and tastes great! Combine 3 1/2 cups berries with the sugar and flour. Spoon the mixture into an unbaked pie shell. Spread the remaning 1/2 cup berries on top of the sweetened berries and cover with the top crust. Seal and crimp the edges of the pie shell and cut “vents” in the top crust for steam to escape. Place 5 small 1/2 slices of butter on top of the blackberries,sugar and flour. Brush the top crust with the milk and sprinkle with 1/8 cup of sugar. Bake in the preheated oven for 15 minutes. Reduce the temperature of the oven to 375 degrees and bake for an additional 20-25 minutes or until the filling is bubbly and the crust is golden brown. Cool on a wire rack or cool oven rack removed from oven. My husband Don and I baked this as a “team” and it turned out great!